What does "pinkness" mean in the following? Something significant happened under cover of pinkness while we were busy agonising over Scotland and Ed Miliband's dodgy memory. 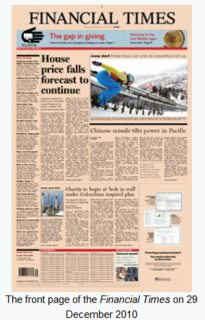 The Financial Times emerged redesigned: new type, new column widths, new colour graphics. What's significant about that, you say? The Guardian: They used to say 'print or digital'. But do we need to choose? On 2 January 1893 the FT began printing on light salmon-pink paper to distinguish it from the similarly named Financial News: at the time it was also cheaper to print on unbleached paper (several other more general newspapers such as The Sporting Times had the same policy), but nowadays it is more expensive as the paper has to be dyed specially. They escaped under cover of darkness. Instead of suggesting that something was done secretly under "darkness", the author used "pinkness" as a reference to their usage of pink. The newspaper article is dated September 2014. As well as the main reference to the Financial Times as described in Em's answer, there are other references to UK politics. The political colour of the Labour party is red, and "pink" therefore implies weak or badly-thought-out left-wing policies or actions. The Scottish referendum on independence was held in September 2014. The Labour party had been a strong supporter of Scottish devolution since the 1920s. In the 2014 referendum some prominent Labour politicians supported the "No" campaign. That culminated in Ed Milliband, the Labour leader, being branded "a ****ing liar and a traitor" the eve of the election by the "Yes" campaign, and being forced to abandon his campaigning activities for a "No" vote on the day before the election. The Guardian newspaper supports left-wing policies, so its readership base would no doubt have understood this sub-text. Not the answer you're looking for? Browse other questions tagged meaning-in-context word-meaning phrase-meaning figurative-language or ask your own question. What does “under the PM” mean?